Load characteristic tests of the 6 Volt (70) and 12 Volt (379) solar panels used for battery floating, before installation. The 6 Volt panel is obviously not producing it's rated current. Conclusion is that it was under illuminated during the test or not performing to Specification. 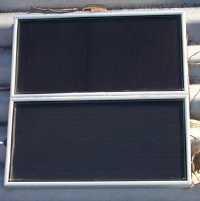 These panels were purchased at the conclusion of the Solar Power Boat Race in 1998 from SolarCorp who were one of the exhibitors. With each panel representing a collection area of 0.04 m2 a 10 m2 patch could be expected to produce 500 Watts with optimum illumination from the Sun.